A paralegal who is part of a litigation team is often asked to assist with witnesses as a part of trial preparation. These activities may begin with choosing the right expert witnesses for your case or pre-interviewing witnesses and providing a summary the litigation team will use while developing the case. To learn how to work with witnesses, it is a good idea to learn from the experience of other paralegals and attorneys who have a great deal of experience. We have assembled some articles we found by legal professionals who have advice to give about various aspects of working with witnesses. Lynne DeVenny is a paralegal from North Carolina. This article gives some very practical tips for locating, vetting and preparing witnesses for trial. It is clear the author’s good advice has been derived from personal experience. We enjoyed this article because it is actually an audio file that you can listen to right from the website. The host of this radio show interviews Katherine James, owner of the consulting firm ACT of Communication. James provides tips for witness preparation such as practicing on camera, the importance of appearance and wardrobe, and more. Steven Babitsky and James J. Mangraviti, Jr. are both former litigators who have trained thousands of expert witnesses. The authors give advice on evaluating a witness to find just the right one for your case. They recommend finding out the specific field of expertise a witness has experience in, of course checking qualifications, evaluating credibility and many more considerations before choosing the witness for your case. Laws.com offers an area of their website dedicated to topics for paralegals. This particular article is a good overview of witness interviews taken at the initial phase of discovery. 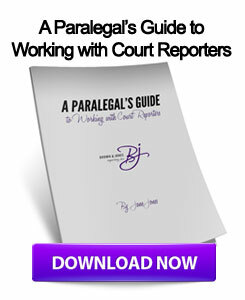 The article discusses the interview summaries and witness statements that paralegals are often asked to prepare for use by the litigation team. The State Bar of Texas Paralegal Division offers information by attorney Wayne Lindsey Robbins, Jr. The focus of this article is how to prepare company witnesses who will be required to testify in a legal matter. If your witness has never testified in a legal matter before, they will need instruction on appropriate behavior such as, asking the witness not to guess when answering, instructing the witness to tell the truth and answer only what is being asked, et cetera. The author also touches on preparing a witness for a video deposition. As a paralegal, you are often asked to work with witnesses so that your other team members can focus on other aspects of the case. Whether you are asked to help choose expert witnesses, or prepare lay witnesses to testify, your work is an integral and important part of preparing the matter for trial. It is a good idea to review these articles and also search for more articles that will help you strengthen your skills for working with witnesses.